Milan, 25 February 2019. REMIX, an international competition for young fashion and fur design talents, organised by the International Fur Federation (IFF) with the support of Vogue Talents, declared three winning designers last night during the annual award ceremony in Milan. 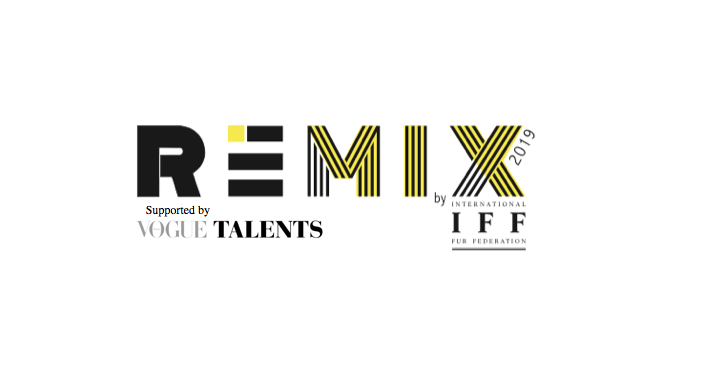 This year, IFF asked the competition’s 10 finalists to create three fur garments that reflected the theme: Responsibility, and Berivan Cemal, from the Netherlands, won the much-coveted REMIX Gold award. Berivan received the Kopenhagen Furs (KF) sponsored prize, which includes a paid trip to Copenhagen for a weeklong stay at Kopenhagen Furs design studio where they will receive 25 premium quality Kopenhagen Fur Mink skins to use in a new style. The jury composed of Sara Maino Sozzani (Deputy Director of Vogue Italy and Head of Vogue Talents), Gabriele Colangelo (Creative Director of Giada), Astrid Andersen (Danish Designer), Bryanboy (Fashion blogger, socialite and businessman), Samantha De Reviziis (sustainability expert and Founder of SDR Agency), have chosen Berivan as the winner of over 100 applications from all over the world. Dong Wang from China won the Saga Furs award, they will receive an all-expense paid trip to Saga Furs Design Centre for a one week of fur innovation workshop. All the winners of REMIX 2019 will have the chance to see their creations featured in IFF’s upcoming fashion advertising campaign: FUR NOW, which will gain global visibility in key fashion media. As well as the opportunity to have an exclusive exposure on Vogue Italia and vogue.it. Mark Oaten, CEO of IFF said: « REMIX gives the media and the fashion industry yearly a sneak peek on how young designers from all around the world continue to create and innovate using natural fur. We have a new socially and environmentally aware generation that is currently crafting the future and we are very proud to have young designers from over 23 countries this year applying to take part in REMIX eager to demonstrate how natural fur can be responsible. From upcycling, to sustaining communities and cultures, to vintage fur and ethical sourcing, the 10 finalists tonight presented not only a responsible collection but also a modern, youthful and vibrant one presenting their vision of the future of fur.”». Sara Sozzani Maino adds, « Remix is an opportunity for the next generation of designers to experiment with, and at the same time to pay attention to sustainability and work for a better future. The level of the students is always very high and it is interesting how each one’s traditions and DNA evolve with the influence of what is happening in the world ». The International Fur Federation (www.wearefur.com) is the voice of the fur industry in the world. Founded more than 60 years ago, IFF protect the interests of the entire sector, promoting its innovation and the achievement of increasingly high quality standards. Today, IFF represents 55 national associations and fur organizations in 40 different countries. Its members represent the entire production chain of the sector: from breeders, hunters, auction houses, leather merchants, tanners, stylists, garment makers, artisans, retailers.